In humans and other animals growth can occur in most parts of the body. As we mature, our bones, skin and muscle all increase in size. Trees do not grow like this. Trees grow by producing new cells in a very limited number of places. These places of cell division are called meristems. Meristems are zones of intense activity. They are where all new cells are formed and where they expand. Trees grow in height as a result of meristems that are located at their branch tips. These meristems are called apical meristems. Roots also expand through the soil by growing at their tips as a result of apical meristems. All buds that you see on a tree contain apical meristems. Trunk diameter growth occurs as a result of another meristem already mentioned called the vascular cambium. The vascular cambium produces new xylem and phloem each year and as a result the trunk, branches and roots continue to increase in diameter. 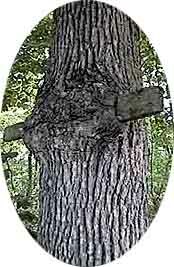 Have you ever seen a fence wire or board grown into a tree? That is the result of the vascular cambium. The fence wire or board doesn't rise into the air because height growth doesn't occur out of the ground, it only occurs from the branch tips.